With the fall season upon us, I naturally think of Christmas gifts for family, friends and colleagues. An all-out gift-giving frenzy is not my style. Nope. I’m centered on one-of-a-kind AND cost-effective presents. 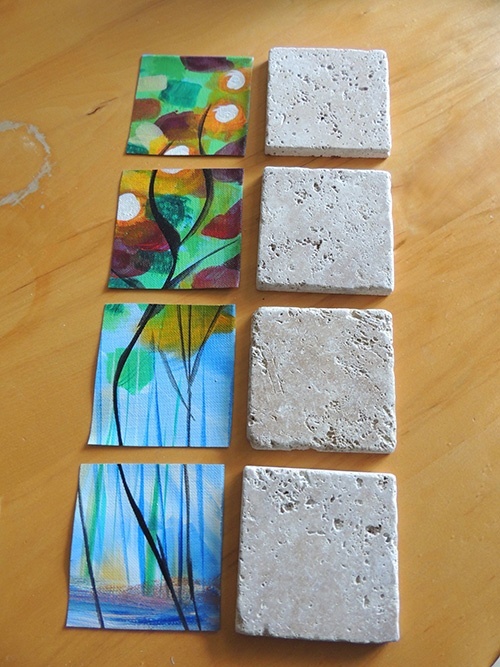 My 2016 agenda is protecting my home’s surfaces using recycled materials that flash style—beverage coasters! The good news is Goodwill has just about everything I need, literally. During one of my frequent visits to Goodwill, I found a box of concrete surface tiles (3.5 inch x 3.5 inch x .25 inch) and an adorable oil painting on canvas, each priced at $2.99. As an avid crafter, I already had the remainder of supplies at home Modge Podge, urethane, contact cork pad, paint brush, sponge, scissors and pencil. Wipe down the surfaces and sides of each tile to remove debris, dirt and dust, if needed. Remove the canvas from its frame using necessary tools—I used pliers and a flat-head screwdriver to get the staples out. Place the top of each tile face down on the back of the canvas. Using a pencil, trace the edges of each tile. Once complete, cut out each square. 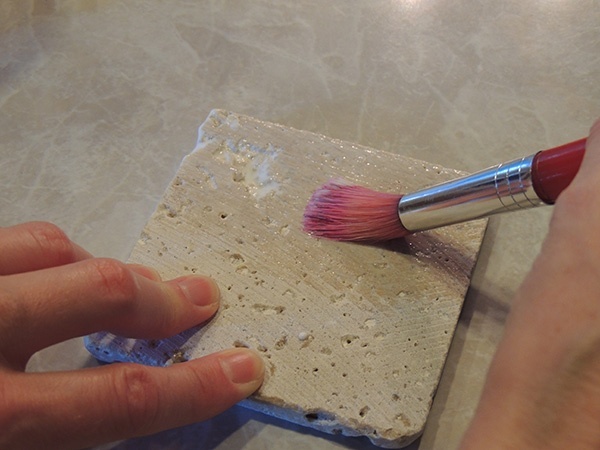 Using a brush (sponge brushes work nicely too), apply a thin coat of Modge Podge to the top of one tile. Place a cut out square evenly on top of the tile. Repeat this process with each tile. Once all the tiles have been completed, let them dry for a ½-hour. After drying, use the brush to apply a thin coat of Modge Podge on the top of each tile, making sure to get the sides as well. 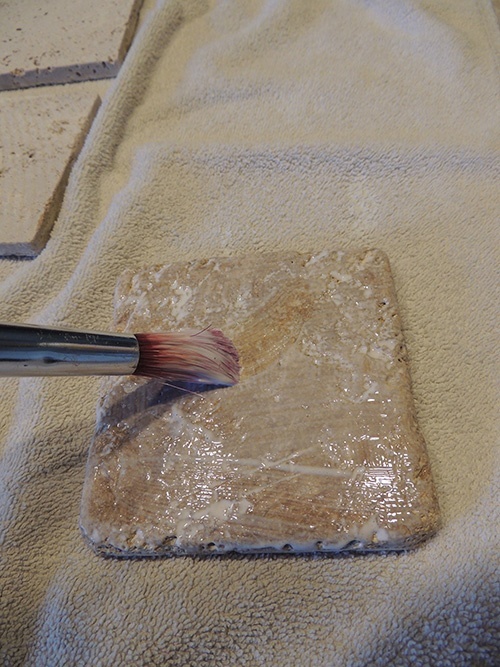 After applying Modge Podge to each tile, let dry for a ½-hour. Repeat this process 2 more times, allowing a ½-hour drying time between each coating. The time to complete this step in its entirety is approximately 1-½ hours. 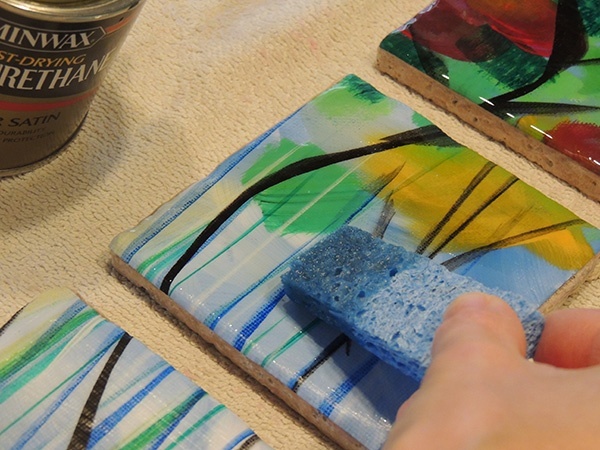 Using a sponge (or sponge brush), apply urethane to the tops and sides of each tile. Allow these to dry overnight. Apply a final coat of urethane to the tops and sides of each tile, allowing the tiles to again dry overnight. The time to complete this step in its entirety is 2 days. After the last coat of urethane has dried, place the bottom of each tile on the flip side of the contact cork pad. Using your pencil, outline each tile. Next, cut out each square. Turn each tile facing down. 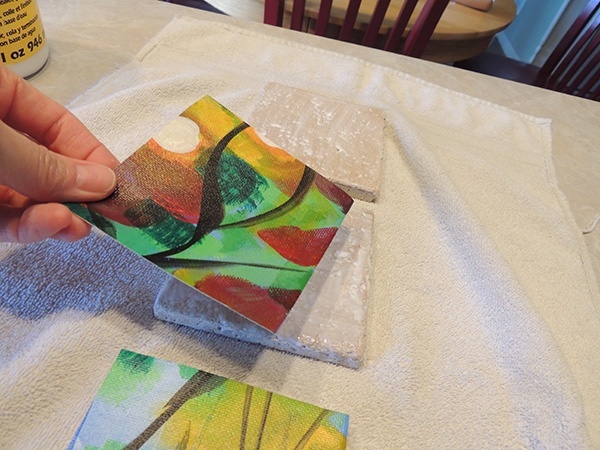 Using your brush, apply a thin coat of Modge Podge to the bottom of each tile. 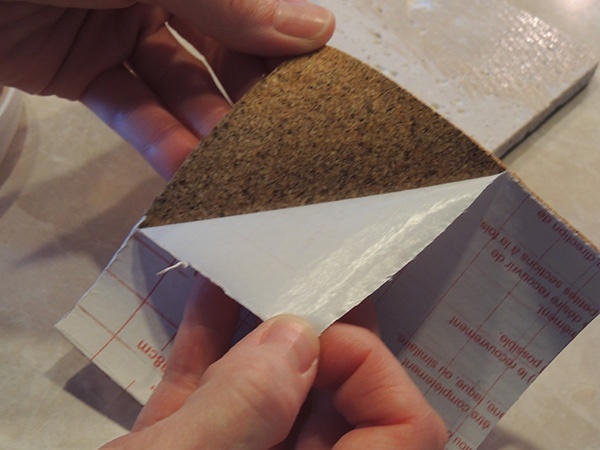 Peel the backing off of the contact cork pad and affix to the glued surface. Turn the tile right-side up and dry overnight. Repeat this step with each tile. The time to complete this step in its entirety is 24 hours. 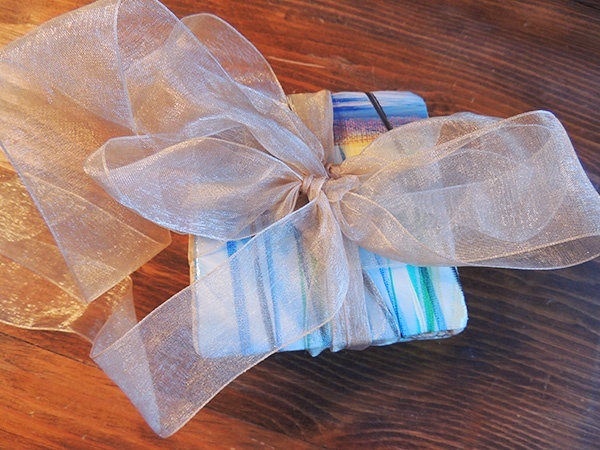 After the tiles have dried completely, use ribbon (or twine) to bundle them for an elegant presentation. 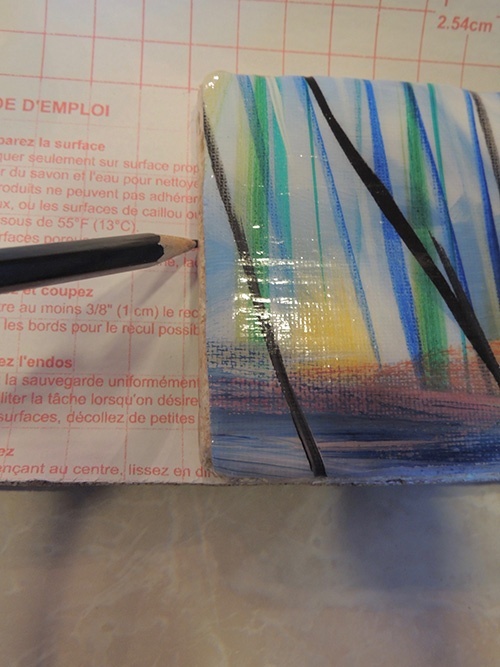 Although I used an oil painting on canvas for my coaster design, there were literally hundreds of different mediums I could have used – prints on heavy card stock, sheet music, book pages (i.e. gardening, novels, magazines, recipes, dictionary, encyclopedia, etc. ), wrapping paper, greeting cards – you name it! Selections are limitless at Goodwill! 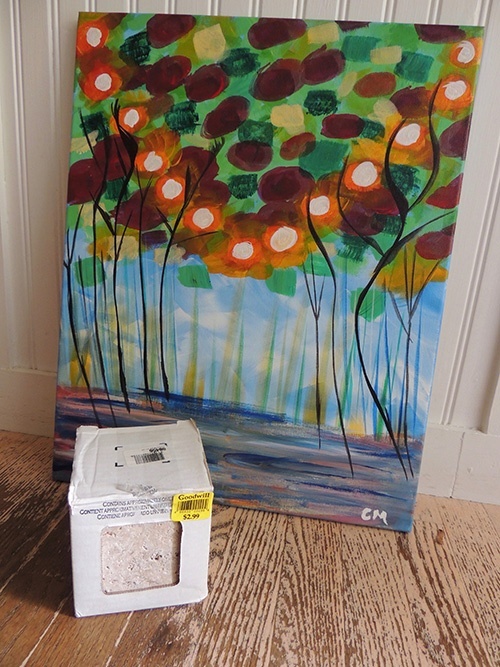 During one of my frequent visits to Goodwill, I found a box of concrete surface tiles (3.5 inch x 3.5 inch x .25 inch) and an adorable oil painting on canvas, each priced at $2.99. 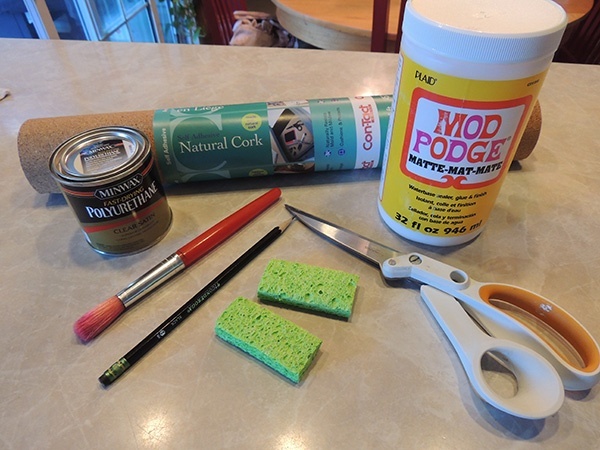 As an avid crafter, I already had the remainder of supplies at home – Modge Podge, urethane, contact cork pad, paint brush, sponge, scissors and pencil. Wipe-down the surfaces and sides of each tile to remove debris, dirt and dust, if needed. 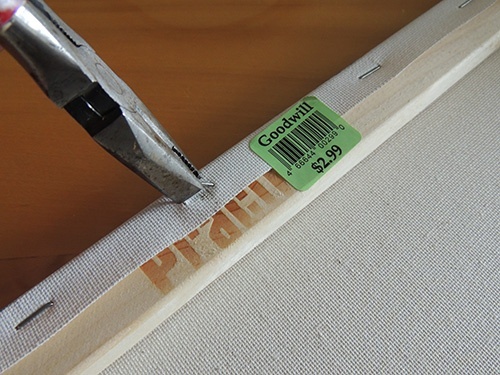 Remove the canvas from its frame using necessary tools – I used pliers and a flat-head screwdriver to get the staples out. 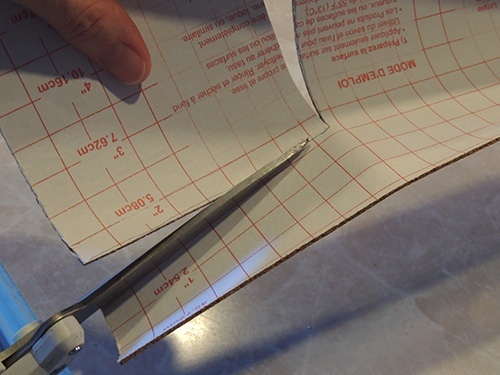 Once complete, cut out each square. this step in its entirety is approximately 1½ hours. After the last coat of urethane has dried, place the bottom of each tile on the flip side of the contact cork pad. Using your pencil, outline each tile. Next, cut out each square. Turn each tile facing down. 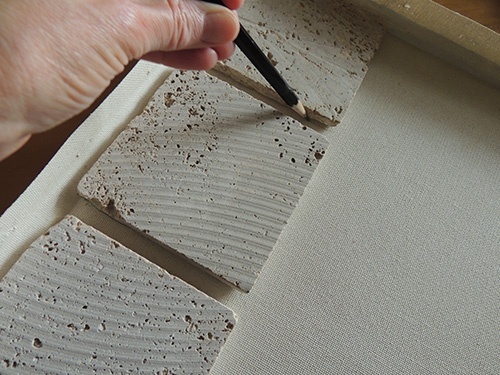 Using your brush, apply a thin coat of Modge Podge to the bottom of each tile. 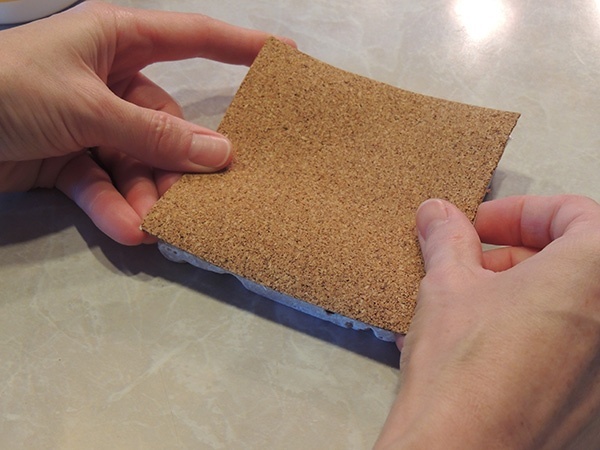 Peel the backing off of the contact cork pad and affix to the glued surface. Turn the tile right-side up and dry overnight. Repeat this step with each tile. The time to complete this step in its entirety is 24 hours.